USAID is providing life-saving humanitarian assistance for people affected by Somalia's severe food insecurity crisis. Worsening dry conditions in Somalia have reduced pasture and water availability across Somalia’s northern regions, exacerbating food, health, and water, sanitation, and hygiene needs. More than 1.5 million people will likely face Crisis—IPC 3—or worse levels of food insecurity through June as a result of below-average October-to-December deyr rainfall, higher than normal temperatures during the ongoing jilal dry season, protracted conflict, and residual effects from the 2016/2017 drought. 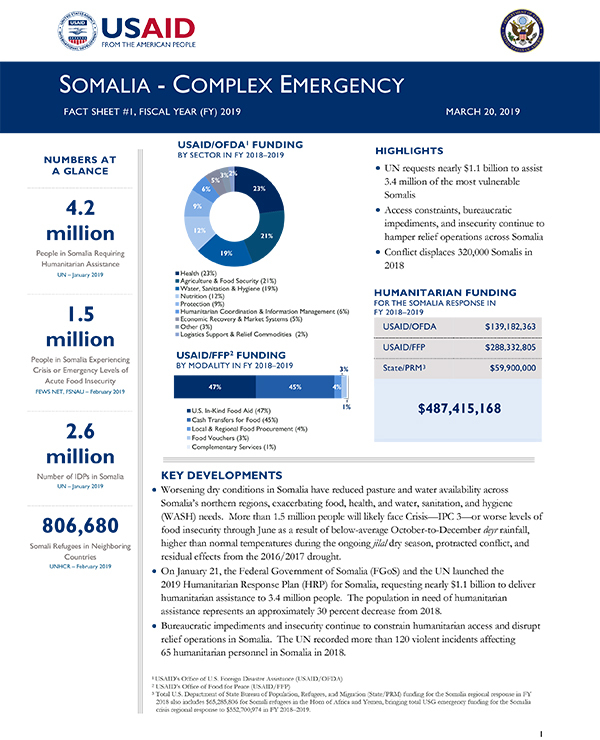 On January 21, the Federal Government of Somalia and the UN launched the 2019 Humanitarian Response Plan for Somalia, requesting nearly $1.1 billion to deliver humanitarian assistance to 3.4 million people. The population in need of humanitarian assistance represents an approximately 30 percent decrease from 2018. Bureaucratic impediments and insecurity continue to constrain humanitarian access and disrupt relief operations in Somalia. The UN recorded more than 120 violent incidents affecting 65 humanitarian personnel in Somalia in 2018. USAID's Office of U.S. Foreign Disaster Assistance (USAID/OFDA) is responding to the complex emergency in the Horn of Africa region, including in Ethiopia, Kenya, and Somalia. Please visit our Horn of Africa web page for additional information. Since 1991, Somalia has experienced a persistent complex emergency due to chronic food insecurity, widespread violence, and recurrent droughts and floods. 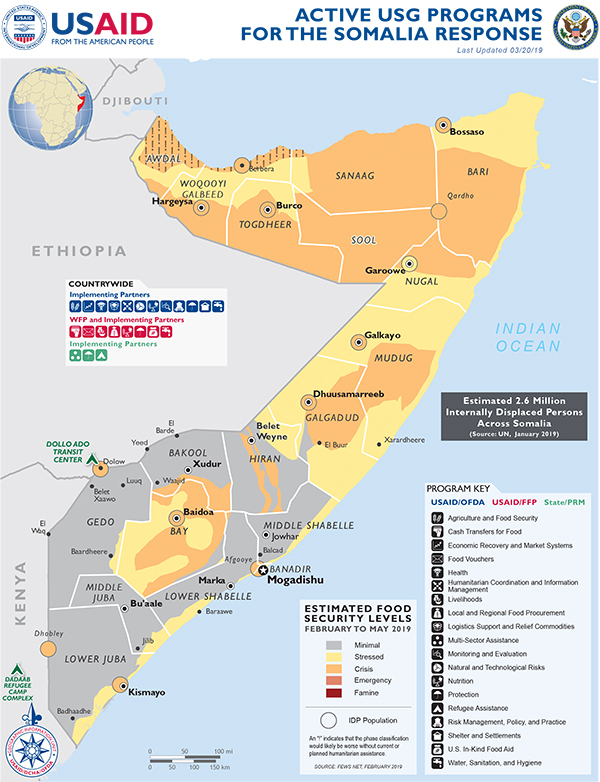 The 2011 drought—widely regarded as the country’s worst in 60 years—severely deteriorated food security among pastoralists and populations in marginal farming areas, resulting in famine in areas of Bay, Bakool, and Lower and Middle Shabelle regions, as well as among internally displaced persons in Mogadishu and the nearby Afgooye corridor. Despite modest improvements in recent years, malnutrition rates in Somalia remain among the highest in the world, and ongoing insecurity in the country—particularly in areas that lack established local authorities and where al-Shabaab is present—contributes to the complex emergency. Sustained life-saving assistance, coupled with interventions aimed at building resilience, is critical to help vulnerable households meet basic needs, reduce malnutrition, and protect livelihoods. An estimated 6.7 million people require humanitarian assistance between January and December 2017.